Ford's F-Series pickup trucks have been available in the United States for six decades with an established reputation for performance and reliability, and have been the country's best-selling pickups for the past 30 years. As a result, the F-Series had become Ford's single most valued product category and brand. In 2005, Ford held nearly 37 per cent of the market. However, the truck market was expected to shrink significantly and increasingly strong competitors were matching the F-150's signature features around power, towing capacity and toughness, making it harder for Ford to stand out. Digital technology was outpacing Ford's own platform development, and the enormous cost of tooling and setting up manufacturing meant that standard vehicle platforms evolved very slowly. In order to retain market leadership and reverse the decline in share, Ford knew it needed to move beyond product performance. Ford went about understanding not just the functional aspects of trucks, but also how a core consumer group - general contractors and construction workers - went about its everyday work life and the role Ford's trucks played in it. Ford's innovation has certainly helped it maintain the F-Series pickups' market leadership, though market share has fallen from 37 per cent in 2005 to 32 per cent in 2011 (January-October). Still, F-Series is way ahead of second-placed Chevrolet Silverado pickups' 23 per cent share. 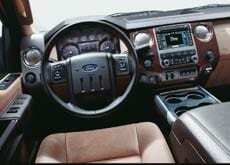 With the surveys in, Ford introduced a collection of integrated technologies into its F-Series pickups in 2008 under the Ford Work Solutions, or FWS, package. These were created to provide better connectivity, flexibility and security to this consumer group. It included four innovative non-traditional features that expanded the product system. It had the first broadbandcapable in-dash computer that allowed customers to print invoices, check inventories and access documents stored in other networks. It also included Tool Link, an asset tracking system that enabled customers to maintain a detailed realtime inventory of the tools or equipment in their pickup boxes. Third, Crew Chief, a fleet tracking, telematics and diagnostics system, which provided dynamic location and performance data that fleet owners need for more efficient fleet and crew management. And fourth, Cable Lock, a security system that discouraged theft of expensive tools. Ford's innovation stems from a shift in focus from product to consumer experience. Taking the value proposition from a reliable truck to a complete mobile workstation that includes on-board inventory management and tracking, Ford has gone from product to solution, from unidimensional to multi-dimensional. Lines begin to blur as distinct technologies and services roll into composite offerings. The framework is simple. Ask yourself who uses the product and why, what for and how, and imagine how that experience of what they are doing could be made a whole lot better and more successful. This kind of approach works well where (i) the traditional product is a medium, conduit or vehicle for achieving other goals and/or (ii) where there are many related products that could be easily integrated with some intelligence to make the experience simpler. Telecom and computing have moved along this innovation path for a decade. Think back to when there was a telephone for voice calling, a typewriter for text, a calculator for computation and a camcorder for video. No more. Today we can have them all on a single device, rolled into one, feeding each other synergistically. It is no longer clear which functional element is the core 'product'. These are devices with multidimensional purpose. Solutions that enable us to do more, better, faster. So where else can we use this sort of principle in India? Let us start with the obvious. What about our trucks? They are the main vehicles for distribution in India, and particularly in our rural agricultural ecosystem, we face enormous inefficiencies with small scattered output. Turning truck fleets into mobile supply chain management systems could go a long way. Imagine truck fleets integrated with tracking systems that would allow drivers to readily access what produce is available where for pickup en route, keep track of on-board pickups and drop-offs of partial load inventories, as well as manage payments and collections for loads. Let us go further and consider something completely different. Consumer finance, for instance. If you define loans as your product, you will look at ways of enhancing the size of the product offering, speed of loan processing or finding ways to lower interest rates to compete in a price sensitive market. Instead, if you define your value proposition as creating a fast, easy, affordable purchasing experience for the customer, you would start to think more broadly about how the experience can be made easier through retail, product and technology partnerships. You can stretch this principle to other completely unrelated products as well. Say the lowly storage jar. Right now, I have a store room with innumerable jars and containers and little idea what comes and goes in my busy household. For restaurants, I imagine, tracking the use of ingredients must be a lot more complex. Imagine if someone would take storage containers and turn them into a programmable storage panel for foodgrains that can store and dispense your rice, dal, flour, sugar, oil, masalas and other staples in quantities that you punch in, and then produce automatic usage reports and order lists. This would decrease the costs of pilferage and cut in half the time taken to maintain accounts. So here's to innovations that turn 'products' into composite solutions that enable us to do more, better, faster, and still make our lives simpler and easier in today's complex world. Ford was proactive in using partnerships to develop the above hardware and software systems to ensure their reliability in use and relevance with contractors. The in-dash computer was developed with Magneti Marelli using Microsoft Auto software and connecting to the Sprint Mobile Broadband network. Tool Link was developed with DeWALT and Cable Lock in partnership with Master Lock. These strategic partnerships allowed Ford to integrate new technologies at a much more rapid pace, and significantly accelerated the original timeline for putting informatics into F-Series trucks. FWS was launched to wide acclaim after 18 months in development, compared with the average four-year design-to-launch cycle. Within months, incremental sales exceeded the total cost of development. It has also caused many business owners to consider changing over entire fleets to Ford trucks. FWS helped sustain F-150's leadership position in the truck category, was recognised as the North American Truck of the Year and was quickly extended to other Ford vehicles. In recent times, several key features of the FWS offering have been subsumed into the SYNC system - Ford's enhanced in-car connectivity system offered across its vehicles.